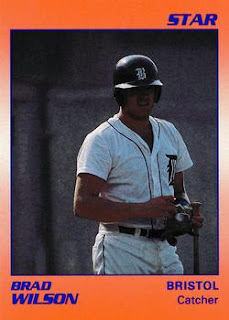 Brad Wilson hit a lot of home runs in his high school career, enough to get him a pro career. From 1986 to 1989, playing for Towns County High School in Hiawassee, Ga., Wilson hit a total of 50 home runs. He also hit seven grand slams. His 50 home runs were enough to still have him eighth all-time in the state. As a pro, though, Wilson's bat cooled. The catcher played just three seasons and hit only a handful of home runs. He never made AA. Wilson's career began in 1989, taken by the Tigers in the second round of the draft out of Towns County High. Wilson started with the Tigers at rookie Bristol. He got into 43 games, hit .221 and knocked a single home run. He moved to single-A Fayetteville for 1990, getting 29 games there and hitting .195, with two home runs. He also got 24 games back at Bristol, hitting .182. In 1991, Wilson saw both Fayetteville and high-A Lakeland. He got into 55 games at Fayetteville and 10 at Lakeland. Between them, he hit .188, ending his career.